We have found one URL that is not SEO friendly! Your webpage has 49 'img' tags and 46 of them are missing the required 'alt' attribute. Your webpage is using 196 inline CSS styles! Congratulations! The size of your web page's HTML is 27.77 Kb and is under the average web page's HTML size of 33 Kb. Your HTML is compressed from 182.46 Kb to 27.77 Kb (85 % size savings). This helps ensure a faster loading web page and improved user experience. Your site loading time is around 3.74 seconds and this is under the average loading speed which is 5 seconds. 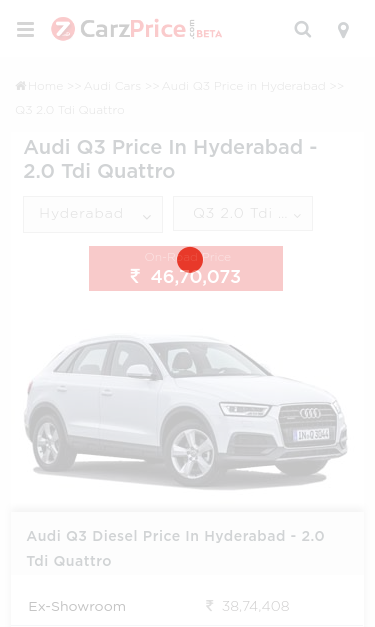 https://carzprice.com/audi/audi-q3-price-in-hyderabad/q3-2.0-tdi-quattro and https://www.carzprice.com/audi/audi-q3-price-in-hyderabad/q3-2.0-tdi-quattro should resolve to the same URL, but currently do not.